Ganttic allows you to filter your tasks, projects, and resources by title or any other custom field related data, enabling a quick and direct way to retrieve a filter’s information easily. Filters are available in the Gantt chart area as well as reports. 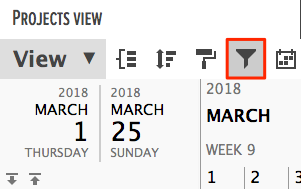 You can add as many filters as you like and as always you can use filtering for a quick search or save the filters to the view to be always able to see the same perspective of a project. Start typing the search criteria. Select the project you're looking for and click 'Apply'. All tasks that aren't connected to that project will be greyed out. The number next to the search box shows you how many filters are applied. Click 'Apply' to remove the filters. If you want to remove all filters at once, click on 'Clear all'.